FBI Special agent Brad Raines is facing his toughest case yet. A Denver serial killer has killed four beautiful young women, leaving a bridal veil at each crime scene, and he’s picking up his pace. Unable to crack the case, Raines appeals for help from a most unusual source: residents of the Center for Wellness and Intelligence, a private psychiatric institution for mentally ill individuals whose are extraordinarily gifted. 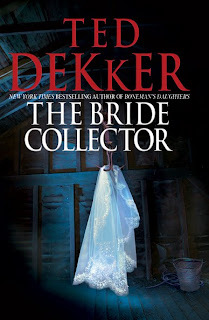 I have always enjoyed this genre, but never had read any of Ted Dekker’s books before. 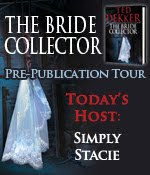 After reading The Bride Collector, I am now a fan and want to read ALL his books! This book did not disappoint! It was very easy to fall into the storyline and connect with the characters. I liked how the author told the story from different viewpoints like Brad, Paradise and from the killer’s side. He allowed us to see what makes each character tick and get a feel for what they are really about. I like books where I can relate and understand the characters motives. I must say that he did an excellent job with the killer and he was definitely a scary and messed up person. The best parts were at the mental institution dealing with the ensemble of quirky characters there. The situations were humourous in parts and also made me feel empathy for people dealing with mental illness. With Paradise, she has never left her home and is basically a prisoner there because of her mind. I can relate to anxiety having suffered panic attacks in the past. The physical symptoms are very real and its not all in your head! I also liked that I was able to learn more about mental illness and came away from reading a little more knowledgable in this area. The only thing I questioned was how fast Brad, the FBI agent, fell in love with Paradise, the mental hospital patient and “medium”. I didn’t really see it happening in real life so it made me think twice at first, but after the story went on, I began to accept the validity of their relationship. I guess because it all happened so fast and I am being pessimistic in thinking it would happen like that. I enjoyed all the twists and turns at the end of the novel and I literally was on the edge of my seat reading. It’s one you won’t want to miss. Pre-Order The Bride Collectorand Get Ted’s First Unpublished Novel FREE.